Born in Milan in 1976, she graduated in Dentistry and Dental Prosthetics in 2000 at the University of Milan. 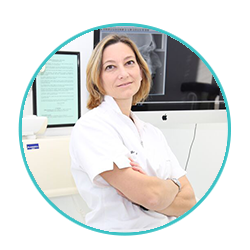 In 2004 she obtained the Master in Forensic Dentistry at the same university and she specialized in Legal Dentistry and Forensic Anthropology at the Institute of Legal Medicine of Milan. She worked for several years within the “R. Galeazzi “Department of Odontostomatology, lead by Prof. R.L. Weinstein, and as a dental and forensic consultant with the Universities of Oslo and Montpellier.